Support for ADA moving forward: $0.04238, $0.03993, $0.03679, $0.03280, $0.029970. Resistance for ADA moving forward: $0.04585, $0.047055, $0.04860, $0.050, $0.05428, $0.05726, $0.06154. Cardano has started the year off well by releasing a PoS paper which is the first academically researched paper on the Proof-of-Stake algorithm. The team is preparing to enter the next phase of their roadmap, Shelley. Shelley will bring some much-anticipated network upgrades to Cardano which will make the network 50-100 times more decentralized, according to the founder Charles Hoskinson. Cardano has seen a small price rise totaling 1.78% over the past 24 hours of trading, bringing the current trading price up to around $0.043, at the time of writing. Having experienced a 41% price decline over the past 90 trading days, the 16-month old project now trades at a value that is 96% lower than the all-time high price. Cardano is now ranked in 11th position and currently holds a $1.12 billion market cap. It now sits $210 million behind 10th ranked Bitcoin Satoshi Vision (BSV). 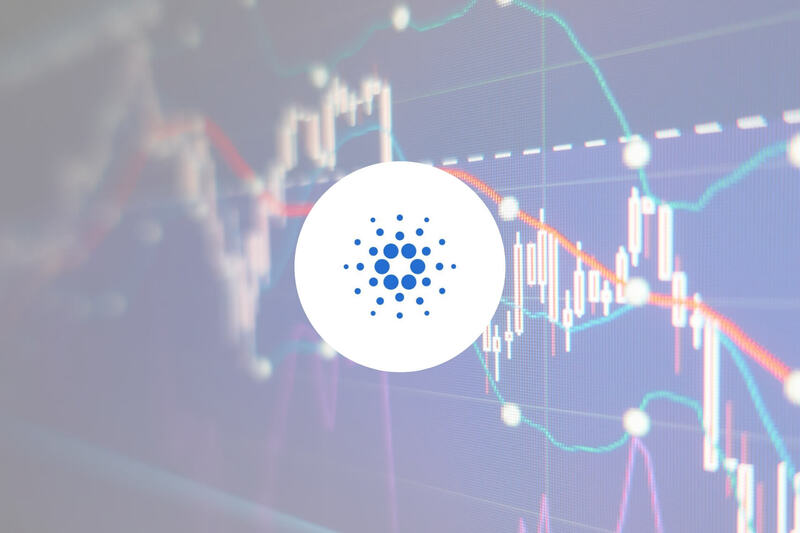 Taking a look at the daily chart above for ADA/USD, we can see that since our last Cardano analysis, price action continued to rise during the first few of weeks of 2019. ADA reached a high just short of our expected resistance at the short-term 1.272 Fibonacci Extension level (drawn in purple) priced at $0.05428. After almost reaching this resistance, the market rolled over and fell. It continued to fall until it reached support below at the short-term .5 Fibonacci Retracement level (drawn in green) priced at $0.03958. This area of support is further bolstered by the previous long-term downside 1.414 Fibonacci Extension level (drawn in red) priced at the same level. Price action has since climbed higher, and is now trading above support at the short-term .382 Fibonacci Retracement level (drawn in green) priced at $0.04338. The market is trading in a neutral condition at this moment in time, but the overall short-term trend is still bullish. If price action can now break back above the $0.04585 handle, the bullish run is expected to resume. For ADA/USD to be considered bearish, we would need to see price action break below the $0.3958 handle. Where is the Resistance Towards the Upside? If ADA/USD starts to climb, we can expect immediate higher resistance at the short-term .236 Fibonacci Retracement level (drawn in green) priced at $0.04585. Resistance following this will be located at the bearish .382 Fibonacci Retracement level (drawn in red) priced at $0.04860. If the buyers continue to push price action for ADA/USD above the $0.050 handle, higher resistance can be located at the short-term 1.272 Fibonacci Extension level (drawn in purple) priced at $0.05428. Closely following this is more resistance at the bearish .5 Fibonacci Retracement level (drawn in red) priced at $0.05503. Further higher resistance towards the upside can then be expected at the short-term 1.414 Fibonacci Extension level (drawn in purple) priced at $0.05726, followed by more resistance at the bearish .618 Fibonacci Retracement level (drawn in red) priced at $0.06146. Analyzing the market for ADA/BTC in the daily chart above, we can see that the market has been performing well against Bitcoin. 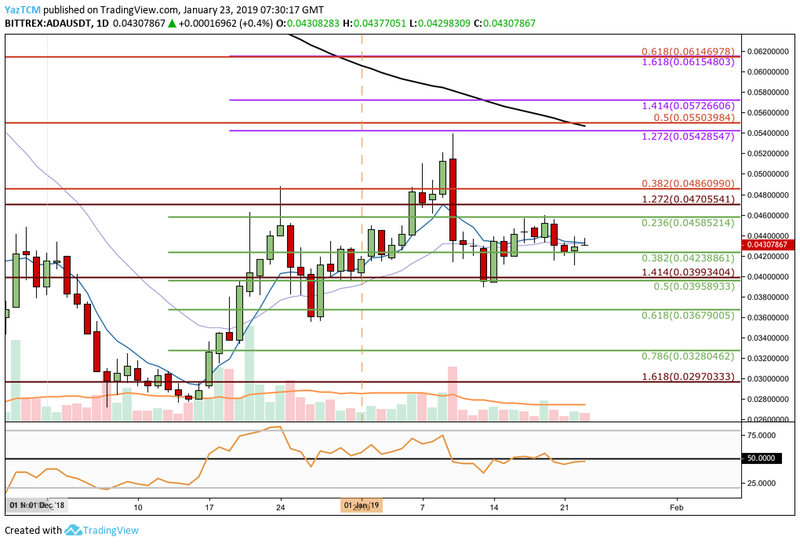 Price action reversed at a low around 830 SATS during mid-December 2018, and has continued to rise during January 2019 to reach a high around 1,350 SATS. The market met resistance, as it placed the high, at a short-term 1.414 Fibonacci Extension level (drawn in pink) priced at 1,344 SATS. After reaching this area of resistance, the market then rolled over and began to fall. It continued to fall until support was reached at a short-term .382 Fibonacci Retracement level (drawn in green) priced at 1,130 SATS. The market then bounced from this support and is now trading at support provided by the short-term .236 Fibonacci Retracement level (drawn in green) priced at 1200 SATS. The trend for ADA/BTC is bullish at this moment in time. For this market to be considered bearish, in the short term, we would need to see price action break below the 1,130 SATS handle. Where is the Resistance Currently Located Above the Market? If the bulls can begin to push price action higher from the current support located at 1,200 SATS, we can expect immediate higher resistance at the short-term 1.272 and 1.414 Fibonacci Extension levels (drawn in pink), priced at 1,293 SATS and 1,344 SATS respectively. 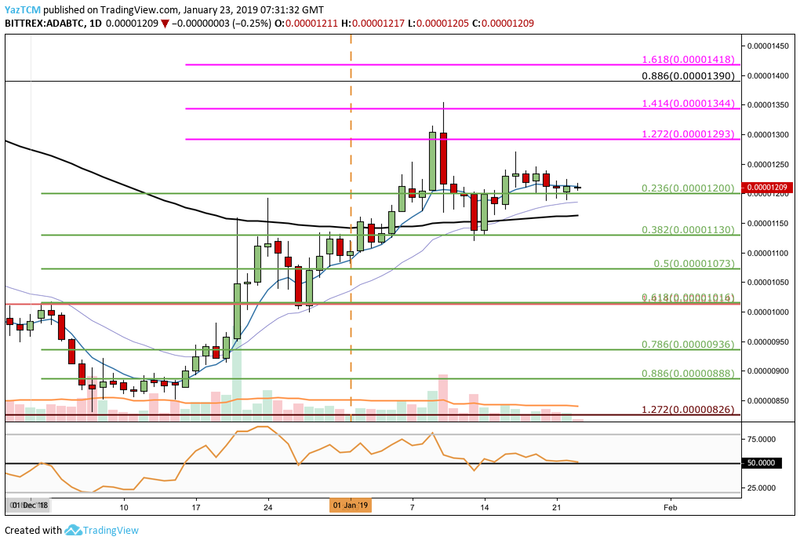 Further resistance above this is located at the long-term .886 Fibonacci Retracement level (drawn in black) priced at 1,390 SATS closely followed by more resistance at the short-term 1.618 Fibonacci Extension level (drawn in pink) priced at 1,418 SATS. Where is the Support Located Below 1,200 SATS? Alternatively, if the sellers push price action below the support at 1,200 SATS, immediate support beneath can be located at the short-term .382 and .5 Fibonacci Retracement levels (drawn in green), priced at 1,130 SATS and 1,073 SATS respectively. Further support towards the downside can then be located at the short-term .618 Fibonacci Retracement level (drawn in green) priced at 1,014 SATS. If the sellers break below the 1,000 SATS handle, further support below can be expected at the short-term .786 and .886 Fibonacci Retracement level (drawn in green), priced at 939 SATS and 888 SATS. Cardano has been performing well in the market as 2019 has started. If ADA/USD can continue and break above $0.050, we could see ADA heading further higher. However, this will require ADA/BTC to break above 1,344 SATS or BTC/USD to climb higher.